McCain campaign calls Obama's economic meeting a "photo-op"
(CNN) -- Sens. Barack Obama and John McCain used news that the United States' budget deficit will hit a record high as an opportunity to criticize each other's fiscal plans. 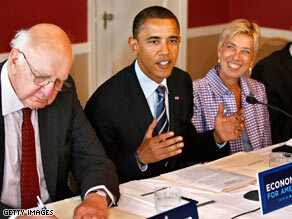 Sen. Barack Obama holds an economic roundtable in Washington on Monday. The White House on Monday projected a $482 billion deficit for the 2009 budget year. President Bush inherited a budget surplus when he took office in 2001 but has since posted a budget deficit every year. The Obama campaign said the White House announcement is "an urgent reminder that our fiscal policies must change." "These have been years of unprecedented fiscal irresponsibility. That's an important issue in this election because Sen. McCain is proposing to continue the same Bush economic policies that put our economy on this dangerous path and that will drive America even deeper into debt," said Jason Furman, Obama's economic policy director. Furman said Obama will "restore balance and fairness to our economy by cutting wasteful spending, shutting corporate loopholes and tax havens, and rolling back the Bush tax cuts for the wealthiest Americans, while making health care affordable and putting a middle class tax cut in the pocket of 95 percent of workers and their families." McCain called the Bush administration's announcement "another reminder of the dire fiscal condition of the federal government." "There is no more striking reminder of the need to reverse the profligate spending that has characterized this administration's fiscal policy," he said. Is he ready to tell us his running mate? John McCain is on "Larry King Live." McCain reiterated his commitment to balance the budget by the end of his first term and accused Obama of having an economic plan that "will not work." "Sen. Obama will not commit to balancing our budget, does not propose to control spending, and has only one answer to every challenge: raise taxes ... It is a plan that will not work for American workers," he said. Both candidates turned their attention to the economy while on the trail Monday. Obama met in Washington with a group of economic experts, including former Fed Chair Paul Volcker, Warren Buffet and Google Chief Executive Officer Eric Schmidt, and McCain's campaign held a conference call with its economic advisers. Speaking at his economic roundtable, Obama blamed "irresponsible decisions that were made on Wall St. and in Washington" for the current economic situation. Obama said his strategy would provide short-term relief and long-term growth for the economy. "It's a strategy that recognizes many of the crises that we face are a direct result of putting off tough decisions for too many years. If we had made investments in alternative energy, in fuel efficiency, we'd be less vulnerable to price shocks. If we had gotten health care costs under control, manufacturers would be in a better position to compete in the global economy. "If we had restructured our financial institutions or our oversight institutions to adapt to a changing global financial market, then we might have avoided some of the worst financial turmoil that we are facing right now," he said. Obama said the country must "respond rapidly and vigorously to problems as they emerge" and reiterated his proposal for a second economic stimulus. McCain's campaign called the senator from Illinois' roundtable "another photo-op." "I hope Barack Obama continues to consult with experts because I think his understanding of the economy leaves a great deal to be desired," adviser Carly Fiorina said. Fiorina said McCain has been talking with top economists like Ben Bernanke and Hank Paulson over the last year "to make sure that he continues to keep his pulse on the American economy." McCain's advisers discussed the senator from Arizona's "Jobs for America" plan, McCain's strategy to create jobs. The plan involves reaching energy security, getting government spending in check, providing access to affordable insurance, growing small businesses and helping Americans facing foreclosure.